Writing directly to the FERC Commissioners, these representatives stand up for the people against pipeline company greed. 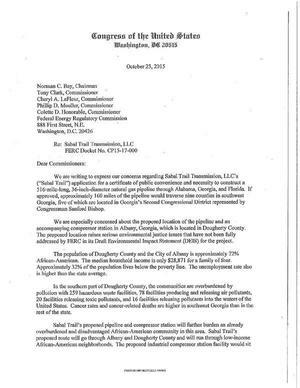 ALBANY, GA — Today, Congressman Sanford D. Bishop Jr. (GA-02) spearheaded a letter with Congressmen John Lewis (GA-05), Henry ‘Hank’ Johnson Jr. (GA-04), and David Scott (GA-13) to the Federal Energy Regulatory Commission (FERC) raising concerns regarding Sabal Trail’s application for a certificate of public convenience and necessity to construct a 516-mile-long, 36-inch-diameter natural gas pipeline through Alabama, Georgia, and Florida. The letter especially cites the proposed location of the pipeline and an accompanying compressor station in Albany, Georgia, which is located in Dougherty County. The proposed location raises serious environmental justice issues that have not been fully addressed by FERC in its Draft Environmental Impact Statement (DEIS) for the project.